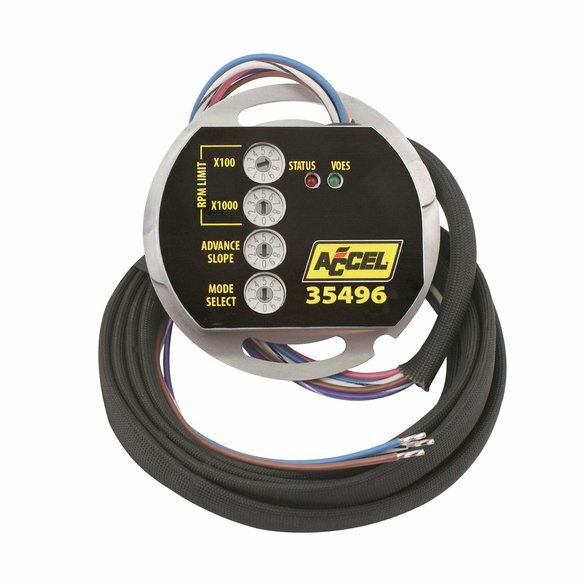 These ACCEL Motorcycle ignition modules work with both single or dual fire coils eliminating the need to buy a new ignition when you change coils. They have 14 preset ignition curves to cover a stock engine through exhaust and intake changes to a full blown big inch high compression motor. Other features include an easily selectable rev limiter and L.E.D. timing light for quick static timing. The harness has V.O.E.S. input, tachometer output, and is externally grounded for better reliability. The housing is machined out of aluminum for better heat dissipation. Many hours of dyno testing went into creating this ignition so that it is simple to use and delivers the premium performance you expect from ACCEL.